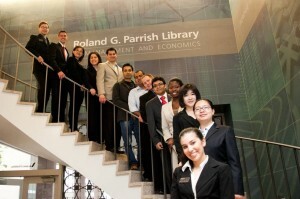 Applications for the Krannert School of Management must be completed using Purdue’s Graduate School online application. International applicants must follow a slightly altered application process. Any individual who is not a permanent resident or citizen of the United States is classified as an international applicant. If you are a Permanent Resident, non-U.S. Citizen, please provide a copy of your alien registration/green card within the online application. Permanent residents who do not provide a copy of an alien registration number will be reclassified as an international student for admission consideration and fees. Please visit our Applications Deadlines page for a complete deadline schedule. We prefer that recommenders be employers who are able to render an opinion on the basis of close, current, and sustained observation. We strongly urge (but do not require) that one recommendation be from your direct supervisor. Recommendations from friends, family members, acquaintances, and other sources unable to evaluate professional or academic qualifications for MBA study are not acceptable. No more than two recommendations are needed. We require that recommenders submit the recommendations online. (No paper recommendations will be accepted) Instructions are provided within the online application. Please note that we will not receive your application until your recommendations have been submitted. Any individual who is not a permanent resident or citizen of the United States is classified as an international applicant. In order to be considered for admission to the Krannert School of Management, international applicants must hold a bachelor degree or its equivalent from an accredited college in the U.S. or abroad. This requires 16 years of education in a University setting, which must be the equivalent of a four year U.S. Bachelor’s degree. Correspondence courses do not meet this requirement. Transcripts must indicate “grades earned” for all courses taken. Please note that a summary of semester totals alone does not meet this requirement. Documents stamped with ‘True Copy’ will not be accepted, which will potentially delay admission consideration. If you were educated outside the United States, and the native language of the country where you were educated is not English, you must upload both a certified official transcript in the original language of instruction and a certified official English translation. *You must also upload a certified official copy of your diploma/degree certificate in the original language of instruction and a certified official English translation. A Provisional Certificate does not meet this requirement. If personal identifying information such as a student identification number or social security number appear on the document, REMOVE THIS INFORMATION from your electronic version of your document or mark out the information in black ink before scanning your document. The Office of Graduate Admissions also accepts electronic transcripts from accredited U.S. colleges and universities sent via eSCRIP-SAFE, Docufide, Parchment Exchange or directly from the accredited U.S. college and university. The transcript must be sent to GRADADM@purdue.edu. Applicants whose native language is not English are required to submit one Language Assessment Test for admission to the Purdue University Graduate School. Students can choose from the Test of English as a Foreign Language (TOEFL) or International English Language Testing System (IELTS). The Graduate School accepts International English Language Testing System (IELTS) scores. (A copy of the official IELTS report must be scanned and uploaded into the online application.) Krannert School of Management requirements are: An overall band score of 7.5 is required for admission, with 7.0 required per each section. For more information, visit www.ielts.org. All scores must be documented by an official report from the Educational Testing Service. The TOEFL and IELTS must be no more than 24 months old at the time the application credentials are reviewed by the Graduate School. As an international student, you may be considered for an English language assessment test waiver only if you have obtained a baccalaureate degree, graduate or professional degree within the past 24 months from a college or university where English is the primary language of instruction, in a country where English is the native language. In order to meet this requirement, receipt of degree must fall within the 24 month period when your documents are under review by the Krannert School of Management and Purdue University Graduate School. Test scores expire on the first day of the month in which they were taken.